A Ravenswood neighborhood hangout, open since April 2008, our authentic Irish pub is a comfortable place where everyone is welcome to relax, enjoy a great meal or refreshing drink and have a good time. We hope to see you soon! SLAINTE! O'Shaughnessy's is open seven days a week for lunch, dinner and weekend brunch. 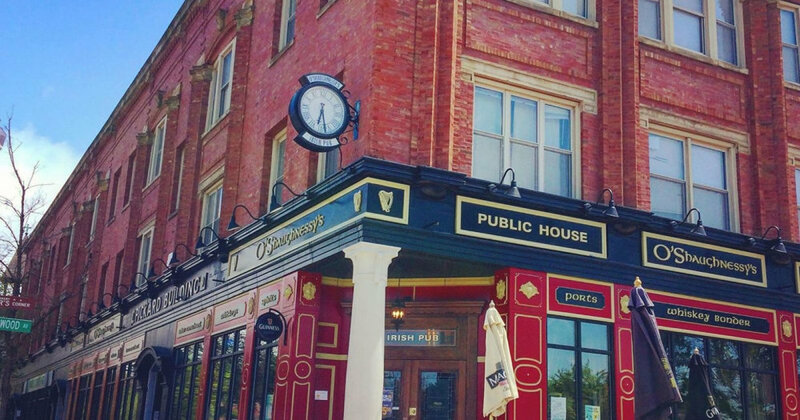 Located in the thriving 47th ward at the intersection of Ravenswood and Wilson Avenue, O'Shaughnessy's Public house is in an ideal location for those taking public transportation, walking, or driving. Mon -Thurs 11:00 a.m. - 10:00 p.m.
Fri 11:00 a.m. - 10:30 p.m.
Sat-Sun 10:00 a.m. - 10:30 p.m.
Sat-Sun 10:00 a.m. - 2:00 p.m.
Fri-Sat 10:30 p.m. - 12:00 a.m.
5 Rabbit, “La Protesta” is beer of the month! Glenfiddich Whisky is whiskey of the month! $6 shots and $9 on the rocks. We are an official Manchester United bar. Come watch all the games.